Please do not combine this page with either author's individual author page. See "Who should/shouldn't get combined" on the Author wiki page. Please edit your book to show individual names. Thank you. 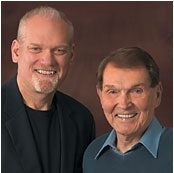 Tim LaHaye Jerry Jenkins is currently considered a "single author." If one or more works are by a distinct, homonymous authors, go ahead and split the author. Tim LaHaye Jerry Jenkins is composed of 63 names. You can examine and separate out names.